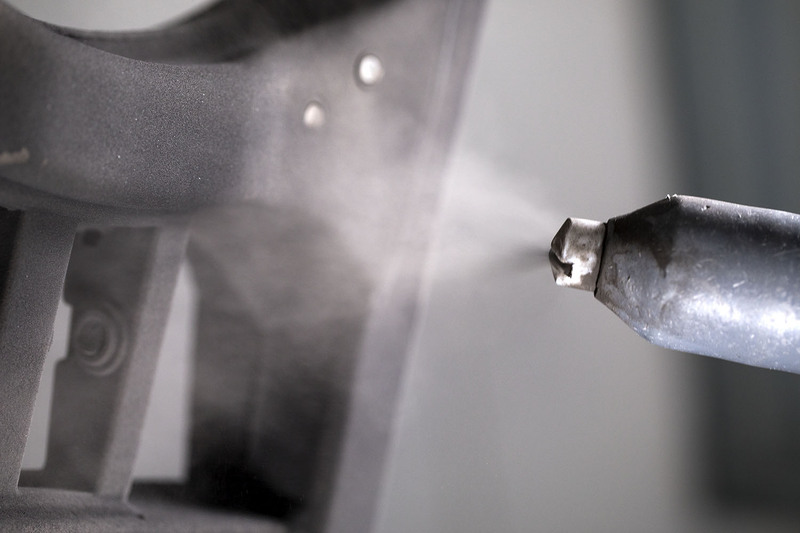 Powder coating is a process in which a dry powder paint (either a thermoplastic or thermoset polymer) is applied to a metal surface using electrostatic application. Unlike traditional liquid paint, powder coating does not need a solvent to keep the binder and filler of the paint in liquid suspension. This allows for application of thicker coatings without running or sagging, and the coatings are also tougher as a result. The powder coating process starts off by electrically grounding the part to be painted, which gives it a net negative charge. After grounding, the paint is sprayed at the part using a corona gun, which applies a positive charge to the powder. The polarization of the two components causes the powder to stick to the metal, where it will remain so long as it is undisturbed. After the powder has reached a specified thickness on the part, it is cured into a polymeric film using elevated temperatures (~200°C), such as with a convection oven. Thermosetting polymers will crosslink during the curing process to improve performance, but thermoplastic varieties simply flow while heated to form the final coating. There are many different colors, textures, and finishes available with powder coating, all achieved with various tweaks to the chemical composition of the powder, application thickness, or curing profile. For this reason, pricing can vary greatly, and is also somewhat dependent on part geometry. The most common polymers used are polyester, polyurethane, polyester-epoxy, straight epoxy, and acrylics. This process adds substantial thickness to a part’s surface, so plugging and masking threaded/reamed holes or other critical-to-function surfaces is recommended. Powder coating polymers are usually insulative and offer poor electrical conductivity.